Does the Tea Party WANT a default? 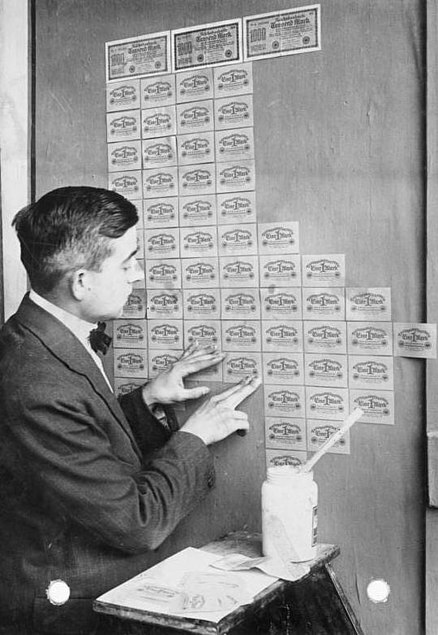 From Wikipedia–by 1923, German currency was so worthless it was being used as makeshift wallpaper. I’ve been watching the clownies in DC dance the debt ceiling dance. What supposedly started as a fight over Obamacare (which more properly should be called ‘Romneycare‘ or even ‘Heritage Foundation care‘) has now morphed into a battle over government size. The Tea Party types, spurred on by ideologues with lots of money (the Koch Brothers are exhibit A), were actively planning the shutdown months ago. And self-identified Tea Party elected officials are flippantly tossing out the idea of default as if it’s no big deal. Since that assertion undermines the whole ‘full faith and credit’ idea (and thus the integrity of the US economy) it’s a mystery to me why such lawmakers aren’t called out for treason. The ugly truth is that the US Dollar is the world’s reserve currency. All oil is priced in dollars, so foreign governments have to keep reserves of dollars. Most international transactions are priced in dollars. There has been grumbling about this over the years, and recently Iran threatened to sell their oil to anyone who had market-based currency. If the US loses the dollar’s reserve status over a default, bad things will happen to the dollar within hours. And anything that the US has to buy from others (oil and food come to mind) will either be hopelessly expensive or unavailable. But what if default is what the Koch Brothers want? Like many in the 1% of the 1%, it doesn’t matter what happens to currency values here or anywhere else. The Koch brothers own rights to oil and energy. Oil and energy will be worth big cash regardless of what happens to the dollar. Now understand that not all of the plutocrats have assets like oil–they might be heavily invested in pharma or media or other endeavors that would take a real hit should the dollar’s value tank. But these are people who managed to keep their wits when the stock market tanked over the Lehman meltdown. They did just fine. And if you’re a plutocrat, you may want a default, followed by a meltdown of the US economy. After all, there is a growing anger at the wealthy in this country, a level of class hatred that hasn’t been seen since the 1930’s. Over the past decade, the 1% have sent millions of Us manufacturing jobs to Asia, along with hundreds of thousands of jobs in engineering, financial analysis, medical billing and IT (computer support) services. There are millions who haven’t had steady work since the 2008 meltdown, and there are millions more who used to build things like earth movers or cars or appliances who are now getting subsistence level wages in retail or ‘service’ industries. Walmart employees don’t make enough to pay the taxes needed to keep a trillion dollar a year Pentagon operating, and they don’t pay enough in FICA to keep the baby boomers in Ensure and at the Early Bird specials. Somebody’s going to need to pay the taxes, and since the 1% have gotten 60% of all income gains since 2008, the fingers are pointing their way. Things will not go well for them under a status quo–a chunk of the country is pulling a bit to the left for the first time since the 1970’s, and Citizens United can only protect the plutocrats’ status quo for so long. But if a default (and dollar meltdown) comes, the Plutocrats are in very good shape. They are after all students of the Shock Doctrine, the idea that you can benefit from (and perhaps deliberately plan and engineer) huge disasters in order to force your way in the chaos that follows. And in a post default world, the students of shock are sitting pretty. If the US is hit with hyperinflation, the paying down of the national debt is easy. You don’t have to call your lobbyists to pressure Congress defund Social Security or Medicare–inflation will destroy the value of the payouts. Ditto public unions–beleaguered governments will stop paying pensions and abrogate contracts. The Parallel to this is the post- World War I meltdown of the German economy in the Weimar era. Hyper-inflation got the government off the hook for a whole host of expenses including many war reparations. And hyperinflation made government pensions and other benefits for wounded veterans and their survivors worthless. It is almost universally understood now that the Weimar Era inflation bubble was deliberately engineered. While we haven’t reached that point yet, it’s clear that the US government has been undercounting inflation for years. And when we don’t undercount it, we game it in other ways–look at the way the Clinton Era Boskin Commission used sleight-of-hand to recalculate the effects of inflation on Social Security. For starters, people need to call the plutocrats out. The Dems are (as usual) being far too polite about what’s at stake. And of course, no Dem politician wants to be labeled a ‘conspiracy theorist‘. Look what happened to Cynthia McKinney. But somebody needs to sound the alarm if in fact the whole goal of the Koch brothers is to change the game permanently. Disclaimer–I could be wrong about everything. I believe you could be right. I don’t know I was intrigued by the movie ‘Moving Zeitgeist Forward’. Giving all the money back (before they blow up the bridges) just sparks my imagination! But to allow the Koch BROs to determine the course of this country when they were not elected is beyond comprehension. We are too complacent we move far too slowly.